TOC has gone from strength to strength since it first went online in December 2006. (Visit our original site here). From a monthly hit-rate of just a few hundred in the early months of 2007, we have grown steadily to more than 600,000 in May 2009; we began with an infrequent rate of articles a month in 2007, we now put out about many more articles monthly by our citizen contributors; these days we register thousands of comments a month, a huge difference from what we used to get in 2007. When Zheng Xi and Andrew first started this blog, they hardly imagined that it would one day hit such heights. For this, the TOC team has two groups to thank. First of all, kudos to our writers, who have stepped forth with their energy and words, put countless hours into their contributions and been absolutely fearless with their opinions. And certainly the second group is our readers – for reading, for giving us critical feedback, for participating vigorously in debate, for making TOC a small part of your lives. No site could possibly have thrived without so committed a family of writers and readers. Anyone wanting to dispel the notion of the apathetic Singaporean need only take a quick glance at the TOC community. Going forward, we would like to build TOC up further. One important aspect of this is reporting. 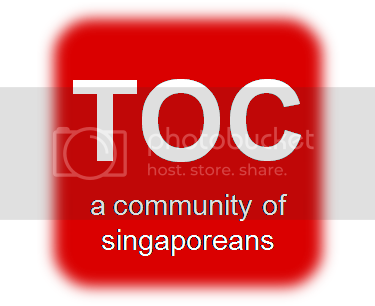 You may have noticed that TOC has begun to edge away from solely carrying commentaries, to try to include reports on current events both in Singapore and overseas, and even media footage where possible. Expanding on this will allow TOC to do more in bringing you the stories or perspectives that are overlooked by mainstream reporters. We feel that this would complement TOC’s unique feature of providing a platform for ordinary Singaporeans to articulate their opinions. However, the reality is that TOC is not sustainable on its current operating model for much longer. Growth has brought about its own problems. The workload of editing the input of contributors, running a nascent news team, writing editorials and articles, site administration, and media footage, etc has grown to a level similar to that of a full-time job and more. These day-to-day operations fall largely to our managing-editor Andrew. He is essentially the only full-time member of the team and draws on funds from his personal savings to sustain himself. At present, this is not wholly fair to Andrew. Other members of the TOC team have tried to help out whenever possible, but we are limited by our individual jobs and commitments, as well as the practical difficulties in trying to divide up the managing-editor’s job into smaller, less time-sensitive parcels. Moreover, the workload of the managing-editor is only growing, as TOC accumulates more contributors and tries to expand on its reporting. (i) The biggest expense will be to pay our managing-editor a reasonable stipend. This will allow the site to justify retaining someone to work on the site full-time, and would also help us when we try to recruit future replacements for the job. (ii) Expenses for our growing band of part-time reporters and contributors, to reimburse them for expenses such as transport or simple meals. It is also a symbolic tribute to their dedication and efforts. Furthermore, most of our intrepid reporters, for example, are students, and we would like to do what we can to help out with their expenses when they cover stories. (iii) Site operating expenses such as site maintenance, administration and AV equipment and to support any future plans. TOC’s accounts and expenditures will be transparent and accessible from the site, so you will know exactly where your money is going. At present, TOC is funded entirely from our own pockets but this is no longer sustainable. Thus, we are asking for your help, however small. To support our work, please click on the button below if you wish to contribute through Paypal or use our bank account number: 656-4-100904 (OCBC, Thomson Branch).